Pupils from Clepington Primary School attended Dundee FC on Wednesday 14 March for a Show Racism the Red Card Event organised in partnership with Dundee FC. The event featured three educational workshops in the morning promoting anti-racism, anti-sectarianism and overall messages of equality and respect, and the pupils were also treated to a stadium tour. The stadium tour was delivered by former Dundee FC goalkeeper Pat Liney. Pat was part of the Dundee team who won the League 50 years ago, the last time Dundee won the League and there are lots of celebrations going on at the moment around the 50 year anniversary, therefore, it was a great time to have the event. During the afternoon the Show Racism the Red Card anti-racism educational film was screened, which features some of the game’s greatest players; Thierry Henry, Ryan Giggs, Rio Ferdinand and Didier Drogba. 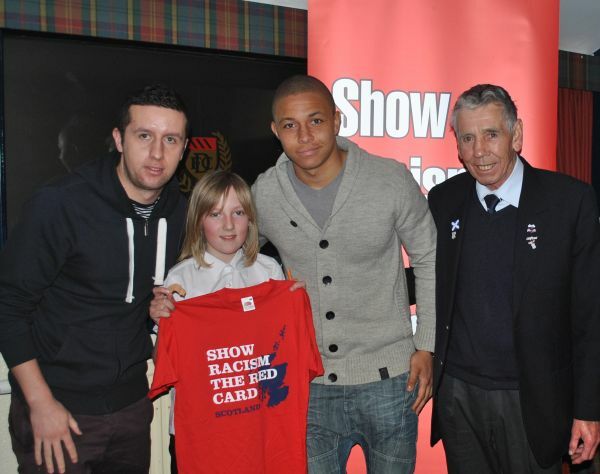 Guests on the day included Dundee FC first team players Leighton McIntosh and Ryan Conroy and ex-professional and Show Racism the Red Card coach Gary MacKay. The guests spoke about their experiences of racism and sectarianism and offered advice on how to deal with, and combat, racism and sectarianism whenever it occurs. Pictured above: Current Dundee FC players Leighton McIntosh and Ryan Conroy, ex-professional Pat Liney and primary 7 pupil from Clepington Primary School.